Celebrate this fantastic festival with our fun range of Oktoberfest Costumes. Oktoberfest is celebrated throughout the World because of its instant party atmosphere and what better way to get into the party spirit than with a pair of Lederhosen or Beer Maid outfit? 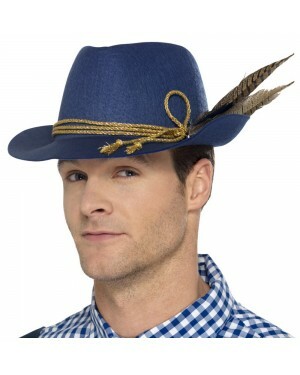 Or if you’re just looking for those finishing touches why not go for a classic pair of Blonde Plaits or a Bavarian Hat. Whatever you are looking for Oktoberfest Fancy Dress will instantly get you into the party spirit. Oktoberfest is of course closely associated with beer - with beer tents popping up across the World to celebrate Munich’s large and traditional breweries. Why not celebrate this great drink with our STUDMEISTER Beer Bottle Costume? The Teetotallers out there need not worry as Bavarian music and dance will surely entertain - and any of our Oktoberfest Costumes are perfect for hitting the dance floor. This is also a great theme to create your own look with a few simple accessories. A simple metal beer mug instantly creates an Oktoberfest look - teamed up with a Bavarian Hat for the Men or Blonde Plaits Wig for the Ladies you can create a great value Oktoberfest Costume from as little as £13.49. So whether you’re off to where it all started in Munich or celebrating in your own home town we hope you enjoy celebrating in one of our Oktoberfest Costumes!